The visual compositions and sheer prolific output of Alicia Feng’s artwork, straddling between classical forms and those enriching the visible language of comics, got my attention. Here, she elaborates on her drawing and illustrating habits, in addition to the uplifting value of having an audience. I happen to encounter randomly this pattern of medical students going into the arts. What compelled you to leave pre-med to your current creative destination as an illustrator and front-end developer for websites and games? As mundane as it sounds, I think it was less of something “compelling” me to the arts as much as I just “fell” into my current career path. Coming from a heavy STEM background, I actually started off strictly wanting to keep art separate from my study/work life, having art as a therapeutic hobby. Clearly though, that plan fell through when pre-med proved to not be a great fit, despite my deep interest in the sciences and all the work I invested up to that point. I was pursuing psychology at the time with a computer programming minor (both things I never touched upon in high-school but had a low-key interest in, thanks to various works of fiction) and decided to stick with these two areas after I fell off the medical track. College was a bit of a scramble after being left with a patchwork skill-set and a lack of direction, but I still managed to pick up internship work with what I was learning, which ultimately helped land me a job after graduation. At the moment, I’m still feeling things out as an illustrator, designer and developer, but I’m extraordinarily grateful that I’m still able to work within my interests. a drawing instrument to draw—and keep at it? 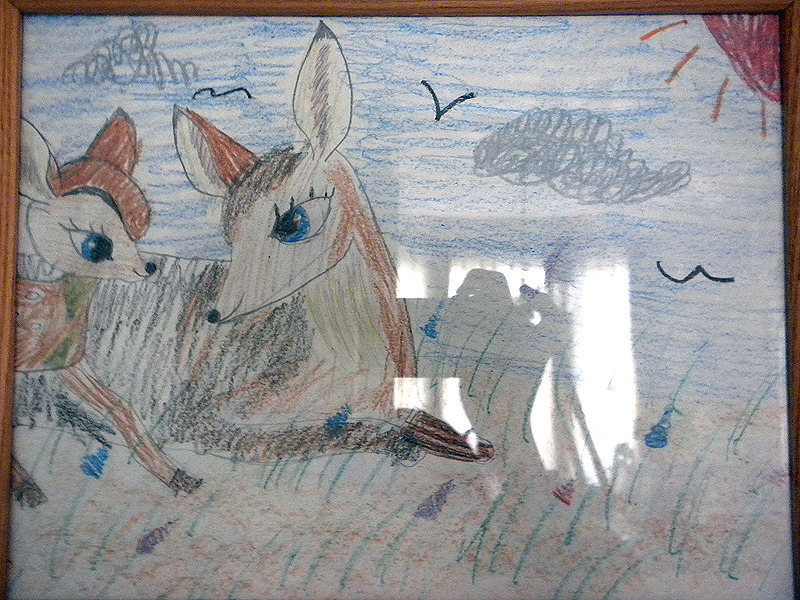 So my earliest memory of drawing was when I was about four when I tried to emulate the concept sketches I saw in a Bambi art book my parents got for me. Disney and Pokémon were definitely the biggest starters for me. After playing Pokémon Crystal, I tried sending the developers (Game Freak) some original Pokémon designs with my parents’ help. I took a few foundational classes and entered a handful of art contests during the time my parents took trying to explore my skill-set, but ultimately art became an outlet to relieve stress, especially during middle-school and high-school. This resulted in a quite a lot of “vent art” ha-ha…I’m not entirely sure what kept me posting during this turbulent time, but seeing people respond positively to my work was very encouraging. I think that’s what ultimately helped give me the confidence to properly brand myself and move forward with my art when I started college. Can you give a tour of how an idea, for an illustration, gets real? Oh man, this is a tricky question. My process is incredibly flexible to accommodate how fickle I can be with my own ideas and tools, but for the most part (digitally, at least), I draft out a piece’s concept first. Usually, I create a vague prompt for myself consisting of a handful of items that I would like to see in a piece together for both aesthetic and thematic reasons, then come up with a general mood. For example, “Ambrosia”—I wanted to capture the feeling of haze and resignation while remaining bright and vaguely tropical. Before I go in and gather any resources, I go into Photoshop with a large brush and small canvas to sketch out a loose idea of what I want. Focusing only on feeling and form, I use both the brush and eraser to “carve out” my sketch until the shape it takes feels interesting enough. After that, I pull together a reference dump if needed, based on what I can find from Google Images and/or my personal stash, then go in with a smaller brush for a cleaner sketch. From here, I make the decision of whether or not I want to do line-art plus cell-shade or paint. Being “self-taught,” how do you practice drawing in order to feel competent and confident at doing this skill? Are there resources you recommend for the emerging artist/illustrator? Life drawing is stupidly important no matter what stylistic choices you go for—I can’t stress this enough. You don’t have to copy what you see 1-on-1 and do hyperrealistic still lives on repeat, but that repetition is an incredibly useful investment towards making drawing more fun. Gotta commit things to memory! The less time you spend trying to figure out how to draw something, the more time you can put into experimenting and actually getting the piece done. Art books are an impulsive buy for me at this point, so I have a good number of reference books lying around. Anatomy: A Complete Guide for Artists by Joseph Sheppard is incredibly handy, especially for artists looking to improve their anatomy, but I think it works even better when supplemented by a more technical text such as Gray’s Anatomy by Henry Gray. Sites like Quickposes and Posemaniacs are handy if you don’t have access to a live figure drawing session, as are reference creators like SenshiStock. In general though, I like browsing fashion pics and game concept art collections for inspiration and study opportunities. 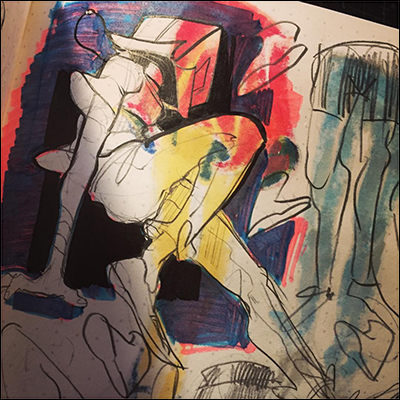 Enjoy a lot your online sketchbook and instagrammed iterations—“scraps”—of your sketches. Do you go through sketchbooks a lot? What’s the average lifecycle of filling in a sketchbook with visual ideas/notions from cover to cover? 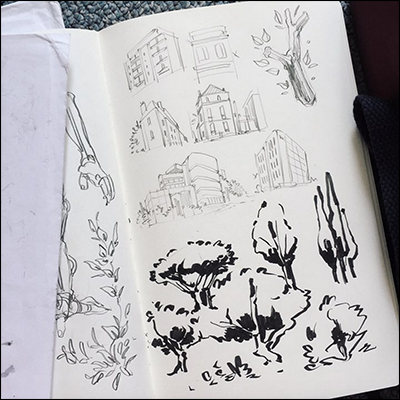 Sketchbooks take me anywhere between 3–6 months to finish. I got through them fairly quickly, so getting gifted them is quite nice ha-ha. The envisioned worlds that came quickly to mind from looking at your work were Robotech, Blade Runner, Vampire Hunter D, among others. What is your go-to mashup of creative and storytelling influences and why? Ha-ha, I’ve actually never seen any of those! My media go-tos though definitely lean towards anime/manga in the cyberpunk genre, Akira and Serial Experiments Lain are probably the two I refer to the most. Satoshi Kon (Paprika, Perfect Blue, Paranoia Agent), Maasaki Yuasa (Kaiba, Cat Soup), Taiyō Matsumoto (Tekkonkinkreet, Ping Pong), and Asano Inio (Oyasumi Punpun) are other big influences that contribute a lot to how I’ve developed my style. Video games are another huge influence for me. There’s too many to really list out (I’ll outline this in another question later anyway), but folks like Jen Zee and Masahiro Ito definitely impacted my art a ton. In terms of more traditional influences, I often look towards Gustav Klimt, Salvador Dali, Edgar Degas and Egon Schiele for inspiration. This is very outdated but I made a list of my online influences. computer programming for websites and games? It definitely drew me to games at the very least! I spent a good chunk of time in high-school on sites like Newgrounds and was drawn to a lot of the short, experimental flash games they had on there. Despite their simplicity and their technical limitations, a lot of them were visually distinct and had interesting gameplay/story mechanics that opened up my idea of what games could be. I hold indie titles near and dear to my heart, because they helped inspire an accessible vision of what code, storytelling and art could accomplish together. Code, in particular, is getting more and more accessible to self-starters these days—instruction’s always good but it’s amazing how much you can pick up on your own now. Are there games that you admire? What are they? Drawing’s always been a stress reliever for me; it helps me refocus. It’s really easy to feel lost and hopeless these days with everything that’s going on in the world, so I’m very thankful that I have art to keep me grounded. I’m also incredibly grateful for the platform it’s given me—having reach definitely makes it easier to organize things like drives and donations and give support to others who need it. I hope my work gives other people the comfort they need too. For the longest time, I struggled with the lower half of the body, particularly the relationship between the knees and ankle, as well as the pelvis. I was able to draw legs isolated from the torso, but putting them together for a pose often proved to be too difficult. In fact, it’s part of the reason why I started drawing so many floating characters—it was easier for me to wrap my head around full bodies in suspension over bodies that were standing and grounded. Commissioned work actually helped a lot by forcing me to draw characters and poses outside of my comfort zone. With enough practice and persistence, I eventually internalized how the body should look. I still have trouble with the lower body, but drawing full-body poses has definitely become a lot easier. as it relates to your career? I don’t think I’ll ever be satisfied with my work. I crave change too much to really settle for something like that. I do know though that, other than keeping my work feeling fresh, I want to remain as accessible as I can to folks that follow my work. Despite the huge number of resources that can be found on the internet these days, I know how difficult it is to identify and gather what you need to grow when you’re just starting out as an artist, especially if you lack the support. Wherever I end up with my art career, I want to be able to ease that initial friction for as many people as I can. What keeps you going as an artist/illustrator? Art gives me a lot of personal comfort as I’ve mentioned, but ultimately all the kind comments and positive reception I’ve received over the years are definitely what keeps me going. I didn’t have a ton of that growing up, so it definitely means a lot. I just got very lucky. 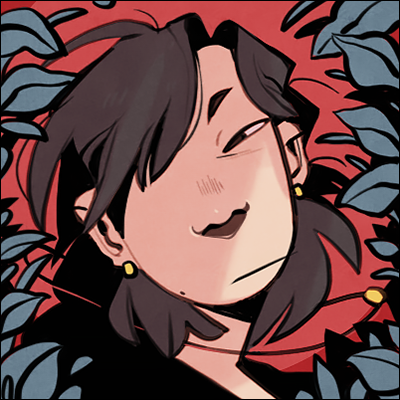 Despite user-name hopping a ton early on, I made some great friends that helped me warm up to socializing online, and I guess as I improved/became more confident and posted more work, it drew in more people. It definitely helps to learn and strategize around each platform’s strengths and weaknesses, but at the end of the day, I think it boils down to the company you keep and who’s willing to support you. So—I’m eternally grateful for everyone that’s stuck around. Well, I can’t say I’m the most organized of folks. 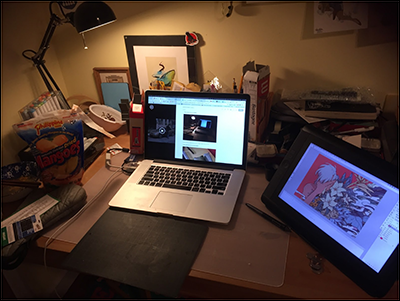 I multitask a lot, so my desk is often a cluttered mess of whatever I’m working on at the moment. Since I get home fairly late and have a very limited window to draw, I think that my style’s adapted to be faster and looser to accommodate the nature of my schedule. Cleaned my desk recently (above), so it’s not as chaotic as it could be—normally I find myself working in a tangle of wires, papers and pens. Do you have a spirit animal? Do tell. Well, most of my active user names are crow-themed, so. Probably that. From all your visual creativity activated and shared, plus studying psychology and computer programming, no surprise that you’re “perpetually tired.” Are my assumed sources correct in rationalizing why you’re perpetually tired or were you referring to something else? To your health! Considering I’m an already low-energy individual juggling what’s essentially two full-time jobs (product design/programming, freelance) between New York and New Jersey every day, I think you’ve got that pinned down. Trying my best to better take care of myself though! All images courtesy of Alicia Feng.